Hello! Is it Wednesday already? Shoot. Christmas will be here before we know it next week. Ready or not… have fun at the post office! Speaking of the holidays, I want to wish a very Happy Hanukkah to everyone who is currently celebrating! If you are somewhat new to the blog, you might be wondering what the heck WIAW means. Well, it’s Wednesday. (Almost) every Wednesday, I link up with Jenn (the creator of WIAW) and take the morning to cover an entire day of my eats. I have received questions on how often I eat, what I eat, why I eat it, and so on. To answer them, I cover the same day (Tuesday) every week for WIAW, and don’t change what I eat or how much I eat for the sake of documenting it. Some weeks I am on point with my goals of eating the rainbow, while others I barely put forth any effort into my meals and grab what’s convenient. Even so, it’s generally healthy(ish). The goal is to get you on board with snacking frequently (again… maybe not so much this week… ha) and trying more nutritious foods. Eating healthy is anything but dieting. It’s a lifestyle I have come to not only live but love. I think y’all can too! Let’s dive right into yesterday’s eats, shall we? 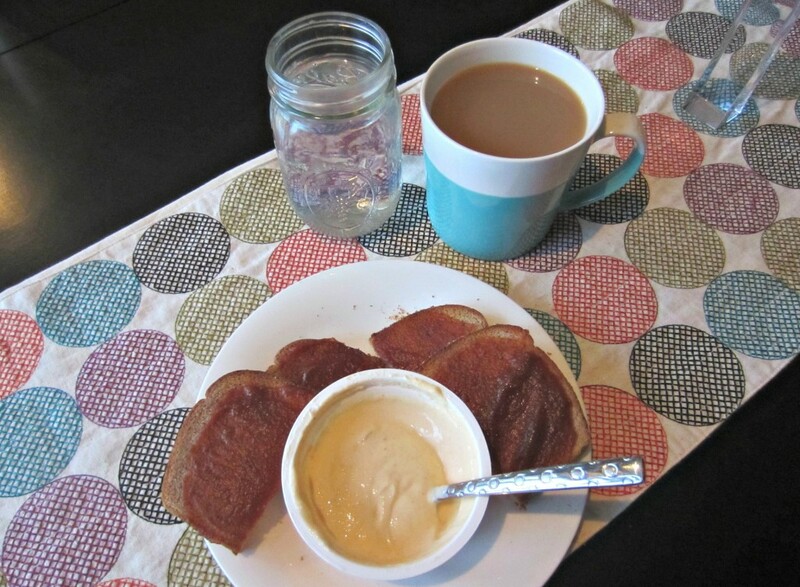 Two slices of whole wheat toast smeared in apple butter with a 5.3 oz cup of pumpkin spice Greek yogurt with coffee. Work at the gym, then return home for lunch. 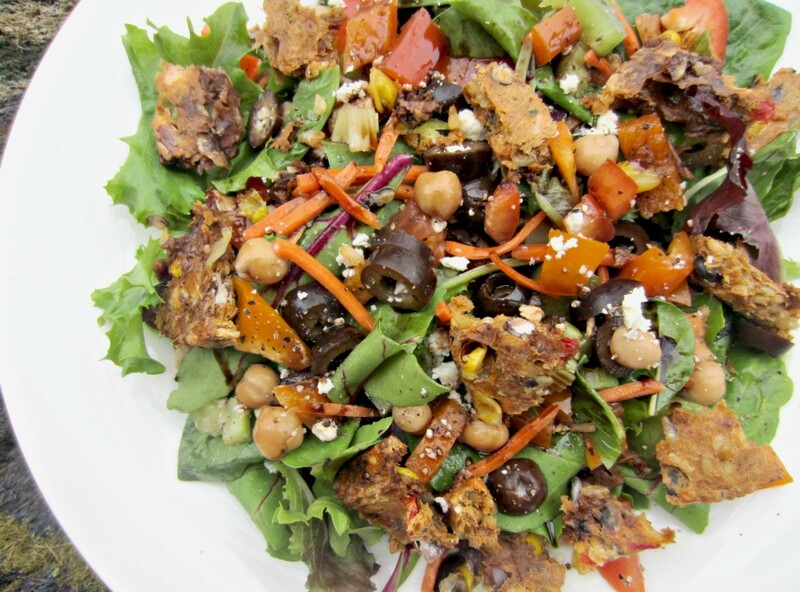 Spring mix greens with tomatoes, red peppers, carrots, chick peas, black olives, black pepper feta cheese, topped in a black bean veggie burger and drizzled in balsamic vinegar. I worked on the computer for a couple of hours, and then took a break to send some packages out at the post office. 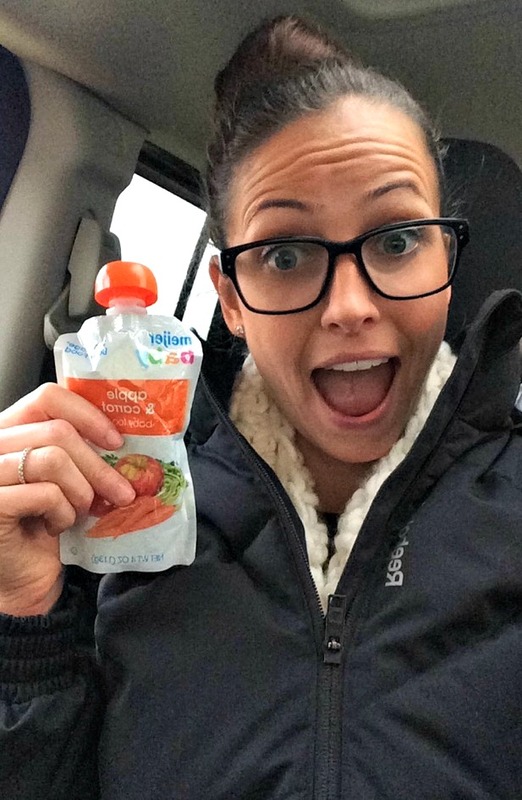 I grabbed another pouch of baby food (flavored adult applesauce to-go) to eat on the way for a snack! Apple & carrot baby food. I swear, the fruity flavors taste delicious. They’re pure fruit and veggies people, c’mon. I ran errands after the post office and returned when it was dark. 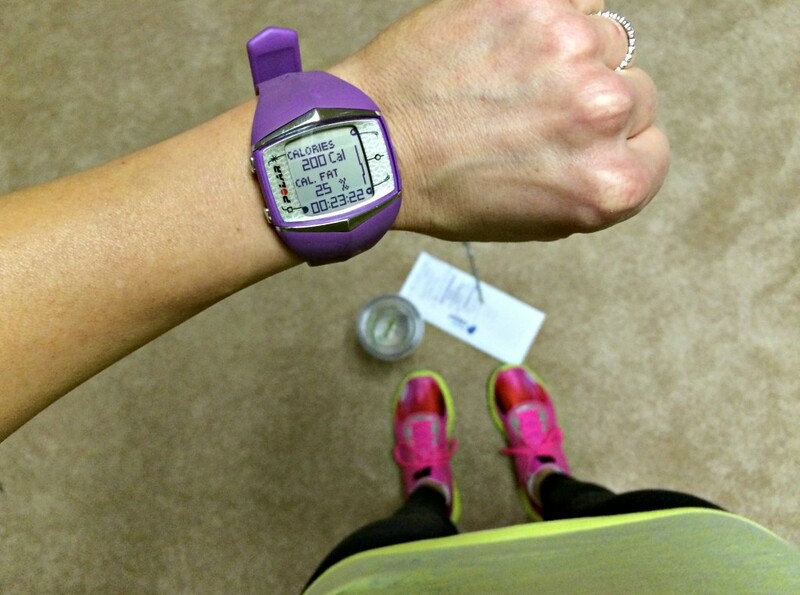 Not wanting to go outside and run, I made up a cardio-focused HIIT workout I completed inside. It requires zero equipment and 25 minutes of your time. I plan to share the details this afternoon! I hurried upstairs to shower just so I could get back downstairs and cook dinner. I was hangry! Scott requests pasta a lot during the week, so I have learned how to make it lighter and include more of the food pyramid. 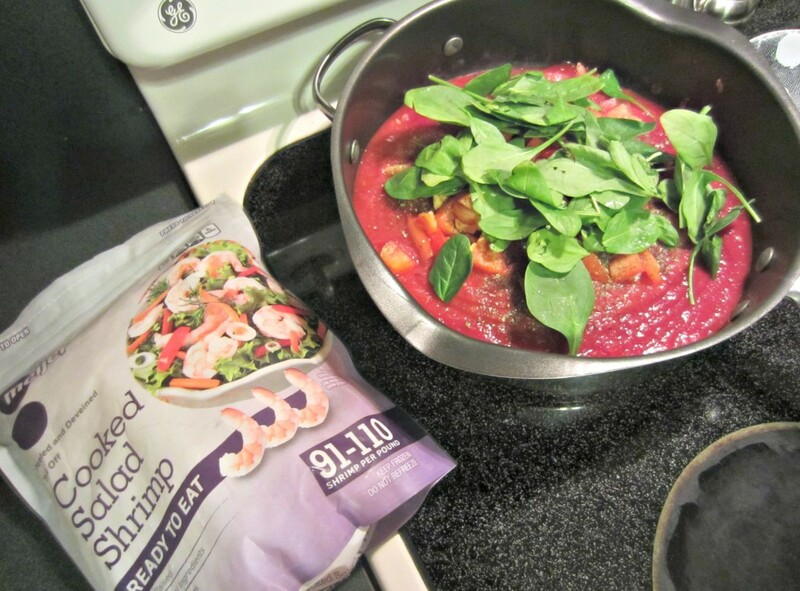 Basically, add any veggies that make sense to the sauce, add a protein, and stick to veggie, wheat, or gluten-free noodles. 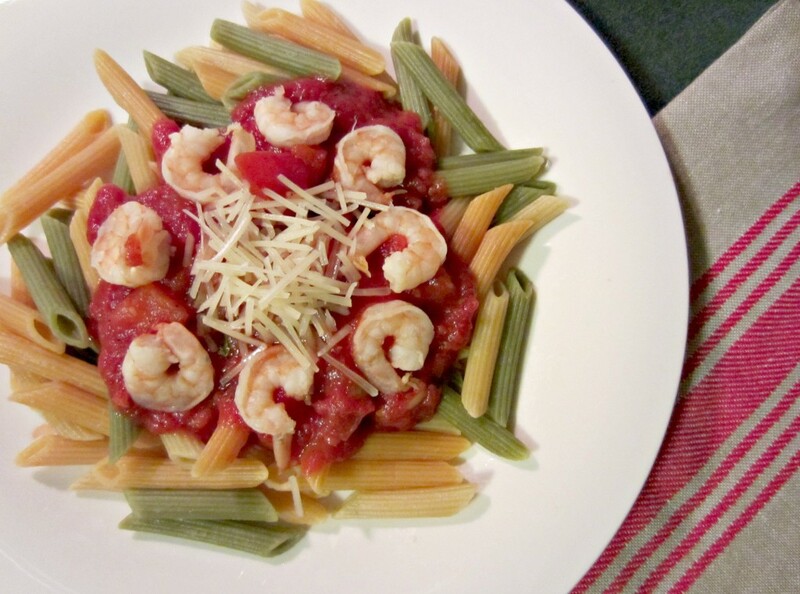 Veggie penne noodles with organic garlic marinara sauce, red peppers, tomatoes, spinach, and baby shrimp topped with fresh Parmesan. Every now and then I’ll revert back to regular angel hair pasta, but I’m fortunate that he usually enjoys the veggie noodles as well. We spent the rest of the night catching up on The Voice while I wrapped presents and finally got to the finale. I won’t spoil it for those of you who haven’t watched yet… so I’ll just say my favorite got 3rd place. They were all so good. This was probably one of the most talented seasons yet! I also made an impressive dent into this coconut milk ice cream for dessert. It lives up to the name, my friends. I chugged a tall glass of dark chocolate almond milk before bed, which you can assume I do just about every night. So good! Oh well… maybe next week! Feel free to explore the “WIAW” tag on the right hand sidebar, click over to Peas & Crayons to check out plenty other WIAW posts, and link your own. See you back later with that HIIT workout! What have your eating habits been like lately? 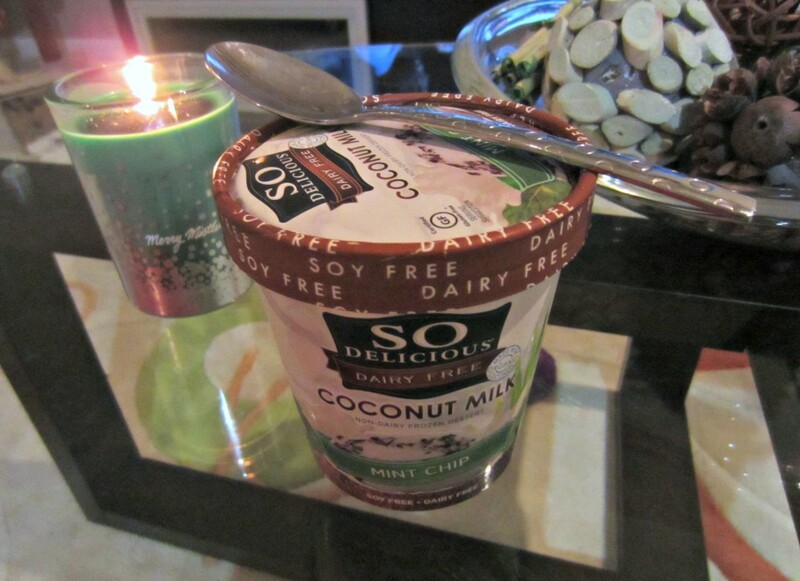 I love coconut milk ice cream! I usually like it best when it is really hot out – the straight chocolate flavor is my favorite. I am headed home to NJ on Monday so I am sure my eating will be a little diffferent, but right now it’s more or less my usual. Good luck at the post office! Ahh totally agree with the third place winner of the Voice haha. I actually went to Capital with him and we were all rooting and voting for him each week! But I’m sure he still has a really bright future with that voice! And I have to say he is as sweet on camera as in real life! Hi Heather! I chug almond milk before bed too. It’s just a thing! 🙂 And I’m trying to be very healthy this week, because starting Saturday when I arrive in Florida all bets are off. We’re going to the Magic game on Sunday night to catch up with all of our peeps too! Ha, yeah traveling is always tricky with staying on track. Enjoy the holidays and being in FL!! Say hello to the Magic fam for us 🙂 Wish we could come too! Oh I’ve eaten the whole thing in two sittings before. This one (somehow) has lasted quite a while. Coconut milk ice cream is to. die. for!!! I’m really looking forward to trying new flavors! I have yet to try the coconut milk Ice cream but it looks great!! Do you recommend any of the flavours in particular? I’ve only tried the mint chip (so far) but it’s SO good! That salad looks delicious, yum! And that is hilarious u eat the apple and carrot baby food, lol! Looks like it is very easy to bring on the go! When my babies come, I’m sure I’ll be sharing some of their food!! Ha! Ha, I know. It’s kind of silly but a really great and nutritious snack at the same time. Whatever works, right? Good luck through Finals!! (Are they over yet?) I know it can get hard to stick to healthy habits. Planning is key. I could definitely get better at that! I can’t wait to read about the workout! I can not get into running outside yet! My Arizona blood has not adapted to this Wisconsin weather yet! I can’t believe that Christmas is next week!!! An yum! That pasta looks good! Ugh and I love that ice cream!! It’s just so easy to eat the whole pint! Delicious eats! I usually use whole wheat pasta, but veggie pasta sounds great too. I legit love baby food!!! haha I used to nanny, and I would always steal their snacks lol! Me too! They definitely raised the bar this season! Ha, I’m sure I could do the same!